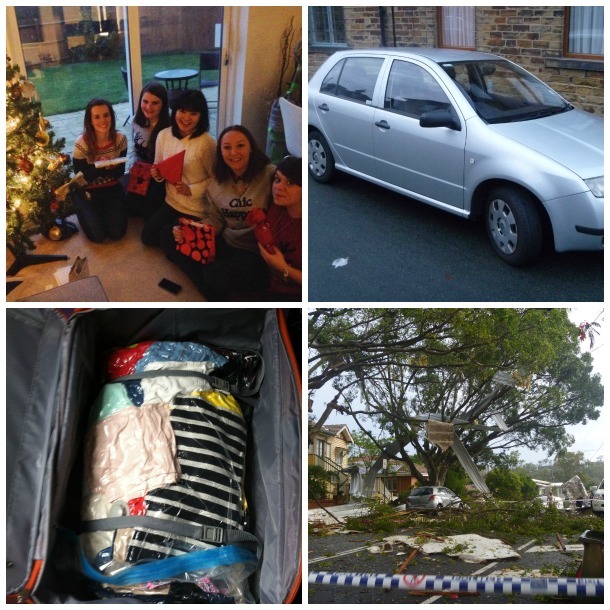 Pre-xmas celebrations, selling my first car, vacuum packing clothes in my suitcase, the carnage after a horrendous storm on our first day in Brisbane- unfortunately these people lost the whole of their roof of their house. It's been a little quiet here over on Nomad Notebook but I've been a busy bee the past few weeks. Within the last month I've seen many friends for pre-xmas celebrations, graduated, packed up my life into two suitcases (how I managed this still baffles me) and moved across the world to Australia! Mr Nomad had been residing with me in the UK whilst I completed my Masters degree, but now I've finished we have moved back to his home soil of Australia for our next adventure together. Whist it's been busy, it's been great to catch-up with some of my university friends and friends from secondary school, and we even managed to fit in a Christmas dinner before I left. I also got my university results for my Masters degree which I've been waiting for since September and I managed to get a Distinction for both my dissertation and for my overall degree so I'm over the moon. Studying full-time whilst also working part-time was really difficult but somehow I managed to pull through which is a great feeling. Now i'm sat here in 26 degree heat and 70% humidity in a sundress writing this blog post- quite a contrast from wearing my hat and scarf in the UK (although it was over 30 degrees yesterday and we had the mother of all storms here in Brisbane with golf ball size hail stones which makes today seem mild). We had a nightmare journey over from the UK to Australia including a cancelled flight meaning we had to be put up in a hotel, and an extra flight from Manchester to Heathrow which added significant time onto the already horrific journey. Our airline also changed three times, but we're just glad to have arrived safely! I will probably write a post about the nightmare flight over as it's quite funny looking back on it and I definitely learnt some tips for long haul flights (like packing extra clothes and underwear in your hand luggage in case of cancelled flights and they refuse access to your checked in luggage..). What has everyone else been up to lately? Has anyone else moved abroad or had a nightmare flight? Australia this time of year does sound nice, except for maybe the storms. That looks like a lot of damage in that photo you shared - scary! Congrats on finishing your master's degree! That is something I'd love to complete myself one day, but will probably have to wait. I bet it feels wonderful to have it done, though! So happy you've made it over. I always pack extra clothes in my hand luggage to be extra safe (i'm a worrier!). Also super glad you got through that storm okay, it looked super intense! Thanks so much Claire! That's such a good idea- I definitely will be packing more clothes in my hand luggage next time, it was a bit of a nightmare! The storm was crazy.. definitely wasn't expecting that the first day we were here!